Stomach twitching is not usually a problem with the stomach itself. Most people refer to the abdomen as the stomach, which is incorrect. The stomach is one digestive organ within the abdomen. What most people refer to as stomach twitching is actually abdominal twitching. It is not an uncommon problem and in most cases it is not serious. Stomach twitching, or more correctly abdominal twitching, can affect any person. There are muscles of various lengths throughout the surface and even within the body. These muscles usually contract and relax in an orderly manner but sometimes the muscles repeatedly contract and relax. This is medically known as fasiculations but is commonly referred to as twitching. Read more on benign fasiculation syndrome. Twitching can occur anywhere in the body. However, there are some parts of the body that are more commonly affected by twitching, like the hands, arms, legs, feet and the abdomen. However it is important to note that the stomach (the digestive organ) also has muscular walls. It is therefore possible that these muscles in the stomach wall may also twitch. Twitching usually does not last for long periods of time. It tends to occur as episodes that last for a few seconds to several minutes. These episodes can recur. Twitching of the abdominal muscles may cause visible movement on the abdominal wall. the muscle can go into spasm and this may be visible as a small lump on the abdominal wall. Pain often occurs with twitching. The part of the muscle which twitches can feel hard to touch. Most of the time these twitches are harmless. With the stomach, this twitching can disrupt stomach function. However, it can be difficult to isolate twitching to the stomach specifically as the abdominal cavity is filled with organs. Is twitching the same as spasm? Twitches and muscle spasms are similar in that there is some abnormality in muscle activity. In twitching the muscle contracts and relaxes vigorously. With spasms, the muscle contracts very forcefully and remains contracted for a period of time. It is also referred to as a cramp. These spasms or cramps can be painful. Muscles that twitch can go into spasm. 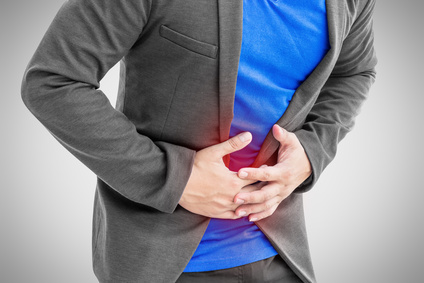 Read more on abdominal cramps. Abdominal twitching can affect any person but infants and the elderly tend to be more likely to be affected. It is more likely to occur with sudden physical exertion, especially when a person is not physically conditioned to deal with the exertion. However, even athletes can experience muscle twitching. Tremors, which can be a symptom of various diseases, is not the same as muscle twitching or muscle spasms. Tremors are rhythmic movements that are unintentional and uncontrollable. Twitches involve only a small portion of a muscle. It is important to differentiate between a tremor and twitching. The former is more likely to be associated with neurological disorders. Excessive physical activity can lead to muscle twitching. This is more likely to affect the legs and arms. However, the abdominal muscles can also be strained when swimming, walking or running as these muscle stabilize the torso at the hips. Naturally strain will also occur with abdominal muscle exercises like sit ups and abdominal crunches. Stretching is an important part of any pre-workout program. However, some people choose not to stretch or the situation does not allow for stretching before physical exertion. The muscle and tendons can then be strained with vigorous physical activity which can lead to muscle spasms or twitching. It is more likely to occur with physical activities that will strain the abdominal muscles specifically. Injury to the muscles can cause twitching. This may occur for a number of reasons. A blow to the abdomen in particular can cause the muscles to go into spasm or twitch. The muscles contract suddenly to absorb a blow and this forceful contraction can lead to twitching. However, even without the muscles tensing, the injury itself can disrupt muscle activity and result it twitches. Muscle twitching may occur when exposed to high temperatures, especially for a prolonged period of time. This is part of heat-related illnesses and may occur with heat cramps. One of the reasons why this occurs is due to dehydration. The excessive loss of fluid and electrolytes affects the muscle’s ability to function normally and twitching can arise. However, twitching may also be seen with cold. Shivering is to some extent muscle twitching. There rapid contraction and relaxation of muscles is a way for the body to generate more heat. It is more pronounced than twitching. Nevertheless, cold exposure should be excluded as a possible cause when abdominal twitching occurs. Dehydration is a common cause of muscle twitching. The loss of fluid and electrolytes disrupts normal muscle function and nerve conduction. Dehydration may occur for various reasons, such as profuse sweating in a hot climate, diarrhea or vomiting.The use of diuretic medication in the treatment of various conditions may also lead to dehydration. It is more likely to occur in these situations with inadequate rehydration. The consumption of excessive diuretics like alcohol and caffeine may cause and exacerbate dehydration. However, dehydration can also be subtle and symptoms such as muscle twitching may arise without a person knowing that they are dehydrated. Electrolyte abnormalities can occur for a number of reasons other than loss with profuse sweating, diarrhea or vomiting. It may be seen in particular with kidney diseases as well as with the use of certain medication. As is the case with dehydration, the electrolyte abnormalities affect muscle and nerve function which may then lead to muscle twitching. The use of stimulants can lead to muscle twitching. Two commonly used stimulants are caffeine and nicotine. Excessive consumption of these stimulants are more likely to lead to twitches. Energy drinks, medication to stay alert and drugs to to treat colds or allergies may also contain stimulants which could lead to twitching, especially if used in excess.